On Friday 9th November Plankton Records are releasing two new titles to celebrate their 40th anniversary as an independent UK Christian record label. They are releasing a 20 track compilation album (CD with 12 page book & digital release) called 'The Second Twenty Years' which, as the title suggests, features music from their last 20 years 1999 - 2018. 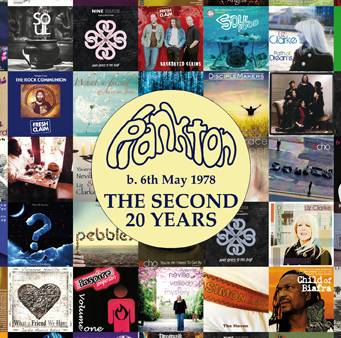 Read More On Friday 9th November Plankton Records are releasing two new titles to celebrate their 40th anniversary as an independent UK Christian record label. They are releasing a 20 track compilation album (CD with 12 page book & digital release) called 'The Second Twenty Years' which, as the title suggests, features music from their last 20 years 1999 - 2018. "We've sneaked in 4 tracks from before that period which for various reasons we couldn't feature on our 'First 20 Years' album - these include one previously unreleased track" says Plankton partner Keith Dixon. "Plankton's founding partner Simon Law has also recorded a brand new song which will close the album and will also be released as a single around October 26." Also on November 9th Plankton are releasing a special 2CD slipcase set (which will also be available digitally) called 'b.6th May 1978. FORTY YEARS 1978 - 2018' which will include the new CD plus the 21 track compilation we released in 1998 to mark their 20th anniversary called 'THE FIRST 20 YEARS'. The slipcase has the strap line 'Celebrating the history and musical journey of Plankton Records'. The cover art also reflects their original vinyl side labels.